I know you are expecting me to say “the start of a new cycling season” – perhaps I’ll tell you about getting out on the road for my first ride of the year. Well even though yesterday was the first Saturday of Spring 2011, I actually didn’t get out on the bike (as much as I would have loved to). Truth is … I was on the golf course. Bigger truth is … I wasn’t golfing (as much as I do enjoy that when I can). No, golfing was not even a remote possibility in this year when winter will just not break and the ground is buried under half a meter of snow! Snow!? The only logical thing to do is get out the skis and take advantage of it. I am embarrassed to admit that this was the first time I’ve had my skis out in the 2010/2011 winter season (and here it was spring already!) I’m not sure what happened – just busy I guess and by the time we got through January I suppose I was just thinking forward to spring and cycling. 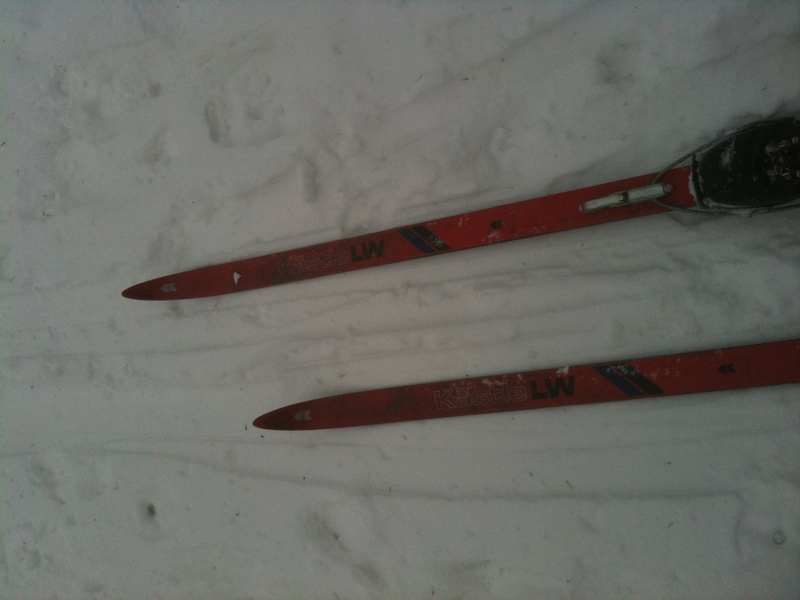 Anyway, I found my trusty old skis and some poles in the garage and dug my boots out of a bin in the basement. I found some old wax that I figured would work for the minus single digit temperatures and rubbed it on. 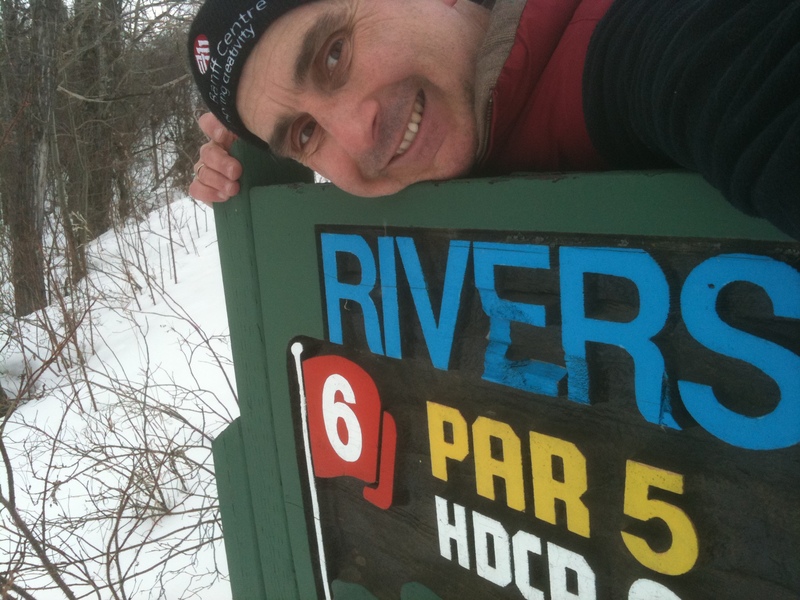 I threw on some clothes that would do the job and headed over to one of my favorite local cross-country ski sites – Edmonton’s Riverside Golf course. I wasn’t sure what to expect for ski conditions. We had some thawing in late winter which I expected would have made the tracks icy and left the off track areas covered in a crust of ice. I was pleasantly surprised – the conditions were excellent. A light snow over the last week had covered any ice there may have been on the tracks and when I went off-track I found a bit of a crust but nothing serious. I started off skiing down the tracks along the sides of the fairway, happy to get into that nice kick and glide rhythm. Before long I was off making my own tracks. 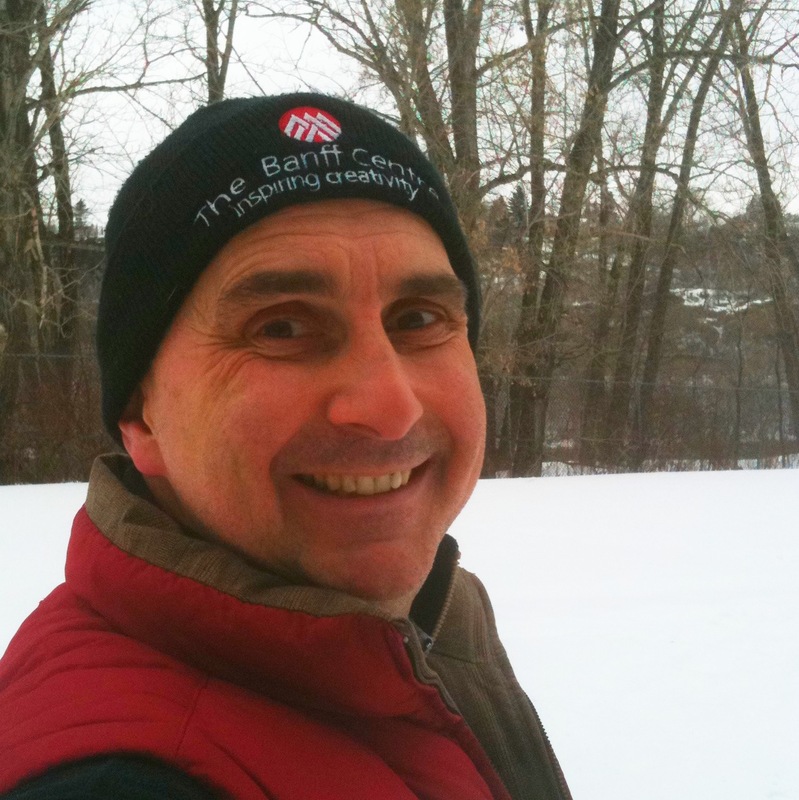 It took a bit of effort to break through the snow but I was enjoying myself and I didn’t mind. I was surprised not to see even one other skier out on the course. The snow conditions were great and with a temperature of about -5C, you can’t complain about the weather (not for skiing anyway). After a bit of time skiing the flats I found myself at one of my favorite playgrounds. At the east side of Riverside the golf course creeps up the bank of the North Saskatchewan River. this makes for some challenging elevated greens in golf season and some hills on which to practice ski turns in winter (or early spring). The only thing about downhill skiing on x-country is you are on your own – no tow or lifts . If you want to come down you’ve got to climb up. So that what I did – a couple of times (only). You turn the tips of your skis out so you don’t slide downhill and step, step, step. These hills aren’t too steep, not too long, but they so allow one to get up a bit of momentum in order to carve a turn or two. I love doing telemark turns on my cross county skis. I was very pleased too link two simple turns together on my first run down. Then I turned around and “herringboned” back up hill for a second run. For my second downhill, I started a little higher, went a little faster and … well you can probably guess where this is going. 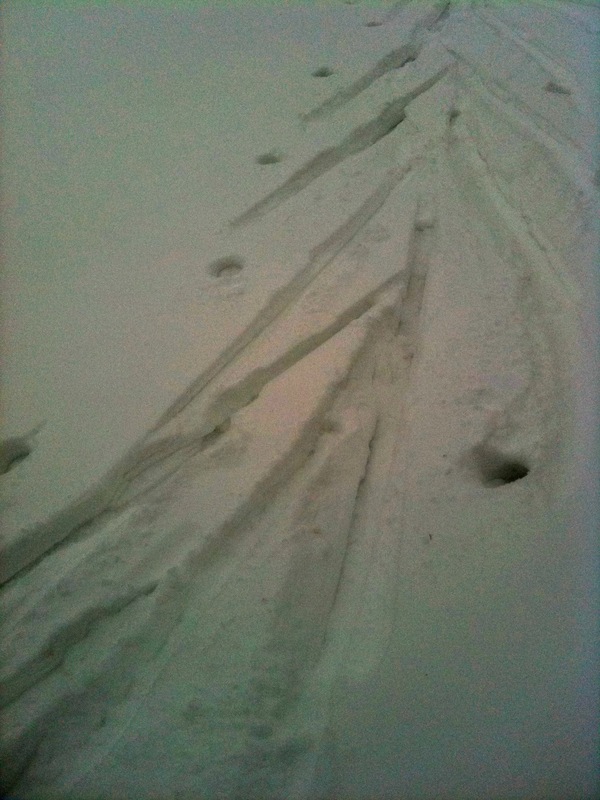 I linked a couple of turns together then found myself going a bit too fast through the bit-too-crusty snow. 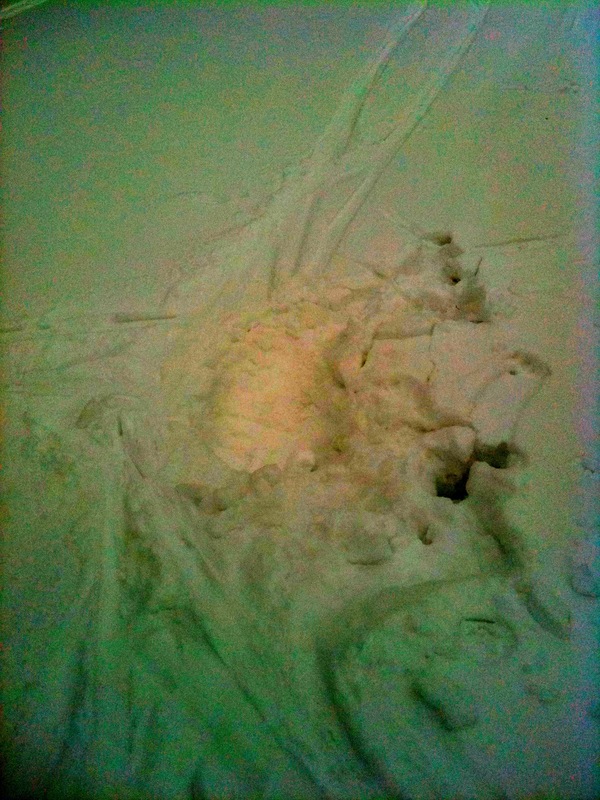 My skis went apart and down I went (see the big depression in the snow in the photo). That was when I truly realized how much snow there was on the ground. It was a challenge to get myself upright; to twist myself around and then push my poles through to the ground so I could leverage myself back upright. After that fun I stuck mainly to the relative flats of the open fairways (but I did go down one more time and had even more trouble getting upright). I ended up being out skiing for an hour and a half. 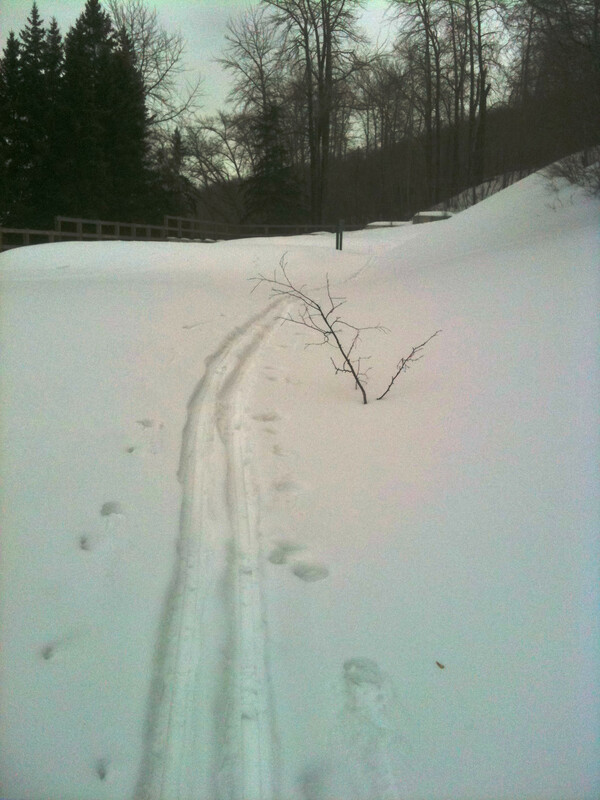 Curiously I did not see any other skier but on the way back I did step off the trail to let a mountain biker go by. I started off the day and weekend as a frustrated and unhappy cyclist, but I was happy to discover my happy inner skier.